Vortex Optics Spotting Scopes - Razor HD, Viper HD and Diamondback spotting scopes each give excellent performance at their price points. The Razor and Viper scopes have available adapters for digiscoping that are well designed and easy to use. All Vortex scopes come in both angled and straight models and include a zoom eyepiece and stay-on case. Razor HD spotting scopes are Vortex's highest-quality scope. Its 50mm, 65mm, and 85mm bodies are made with XT optical design, advanced multi-layered XR lens coatings, premium grade XD glass, and the ultra-hard ArmorTek™ exterior lens coating, Razor HD scopes are completely fog- and waterproof. 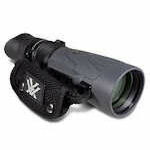 Vortex Diamondback spotting scopes are good quality scopes in the $400 to $600 price range. Diamondback scopes come in 60-mm mid-sized and 80-mm full-sized versions in both angled and straight bodies. All are fully rubber armored and completely fog- and waterproof. Diamondback scopes also have ArmorTek-coated lenses, to protect them from oil, dirt and scratches. 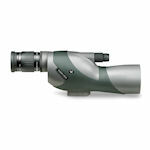 Vortex Recon spotting scopes are 50mm hand-held optics made with XD glass and XR lens coatings. Recon scopes can be attached to tripods, gun stocks and bi-pods. Available in 10x or 15x fixed magnifications, Recon scopes also offer the option of a R/T ranging reticle. 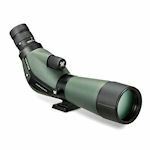 Vortex Viper spotting scopes feature 65- and 85-mm objective sizes, angled and straight configurations, all with HD glass. All Viper spotting scopes are argon-purged to be completely fog- and waterproof. 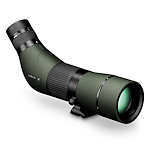 Viper scopes come with either 15-45x (60 mm) or 20-60x (85 mm) zoom eyepieces.